Creating characters old and young can be an exciting and fun task to try. However, to make the character believable, attention to detail is needed. 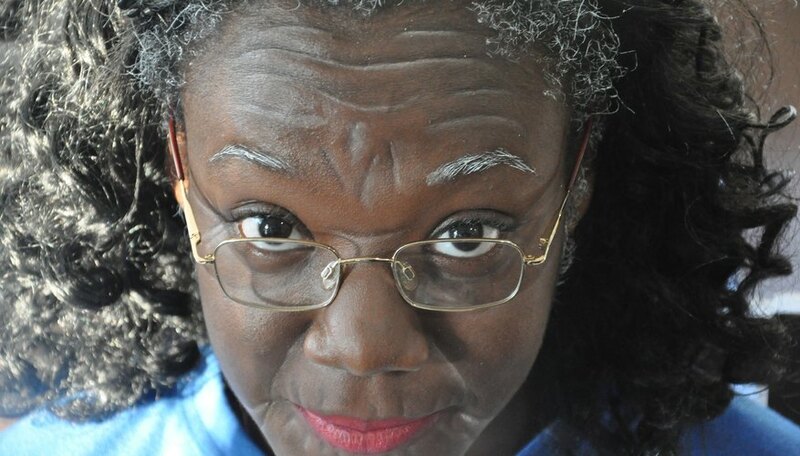 You can find makeup supplies at your local costume shops, but if you are trying to make this "Old Lady" character on a budget, you can create this look with makeup you may already have in your drawer. 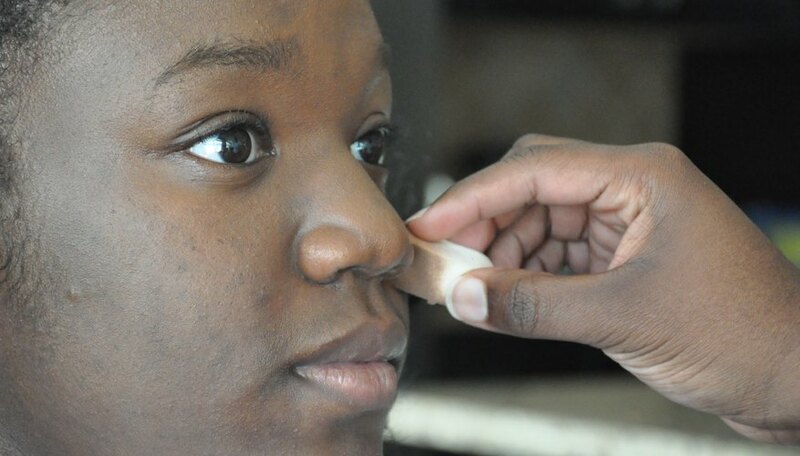 Using the sponge, apply a base coat of foundation to face and neck. Looking in the mirror, wrinkle your forehead and apply the brown eye shadow, using a eye brush or cotton swab, into the creases of the skin. Next, add brown eye shadow to the hallow space on cheeks, jowls, smile creases (called nasal folds) and neck. Add the white eye shadow to all the areas you placed brown eye shadow. 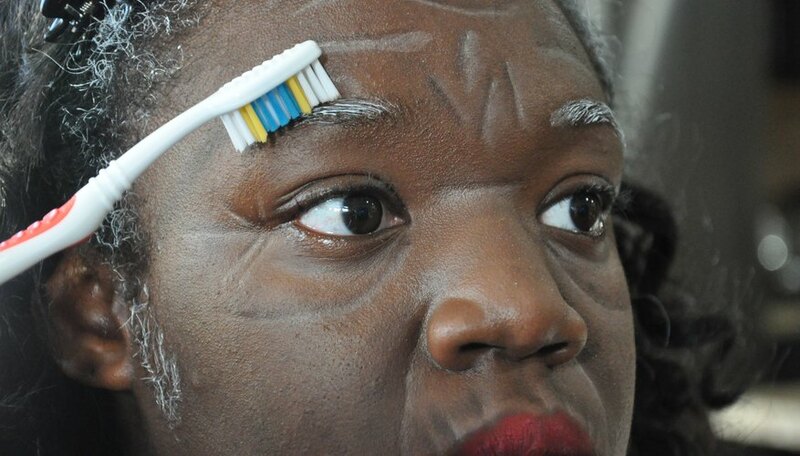 This will make the face look contoured. Using a clean sponge and brush, feather the shadow lines, leaving the brown eye shadow in the deep-set wrinkle areas Blend the white eye shadow softly downward into the darker shadows. To add crows-feet, squint your eyes and with the brown eye liner, apply to the corners of your eye. Scrunch the rest of your face and add wrinkles around the lip, under the eyes and around the nose. Set the makeup with powder and give your face a light dusting. 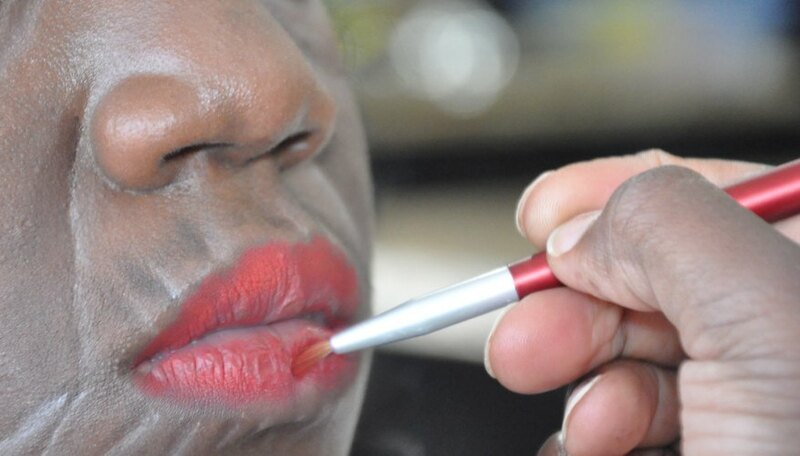 Apply red lipstick to your lips. Pucker your lips with the plum pencil and add wrinkles. Using your finger, dab a little white eye shadow onto your lips to create a deep set of wrinkles in the lip area. 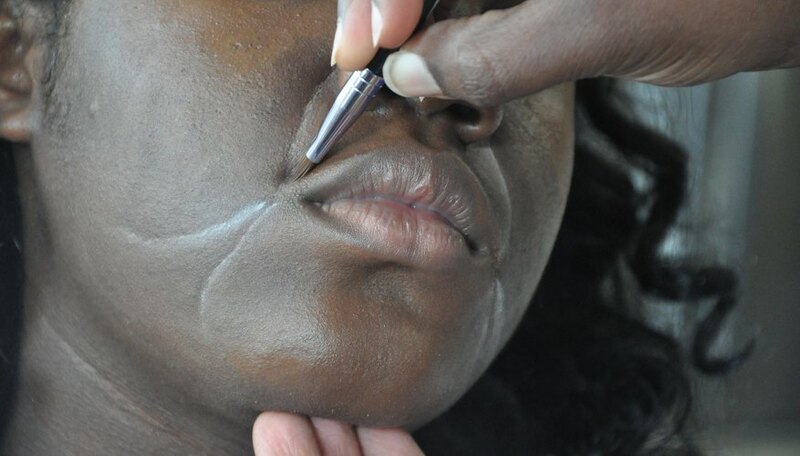 Set the lip area with powder. 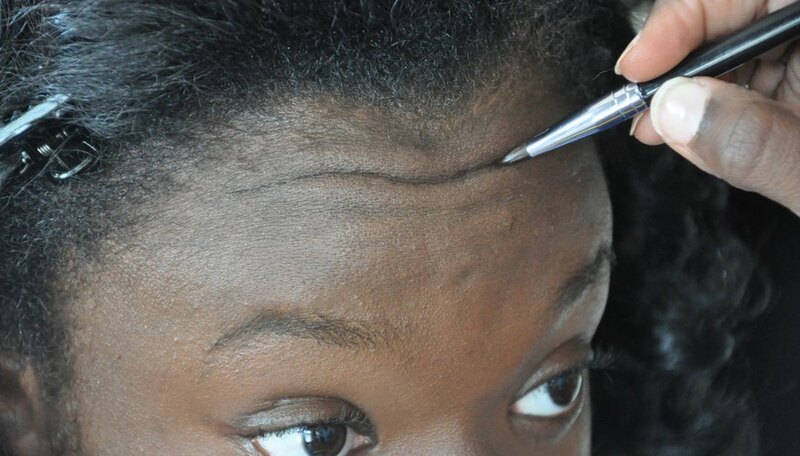 Use a toothbrush or sponge to apply white powder to eyebrows and into the hairline. 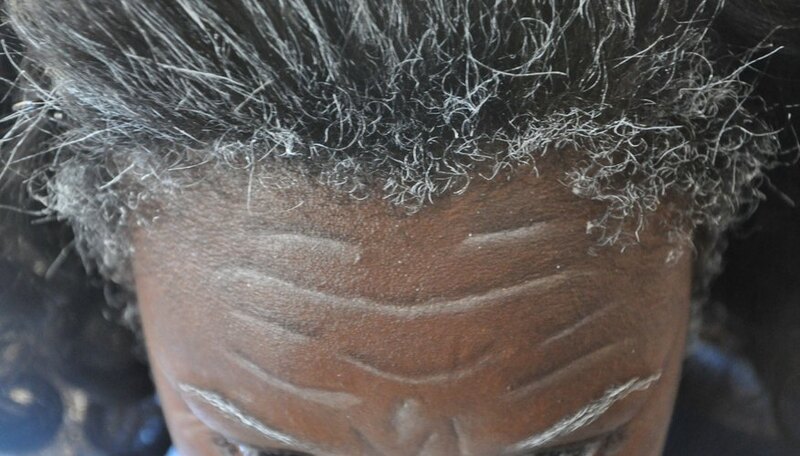 Finish the look with a gray wig or silver hair spray. For kids, add talcum powder in hair. There are many pre-packaged makeup kits available at your local Halloween and costumes shops to create instant, fun and believable characters. 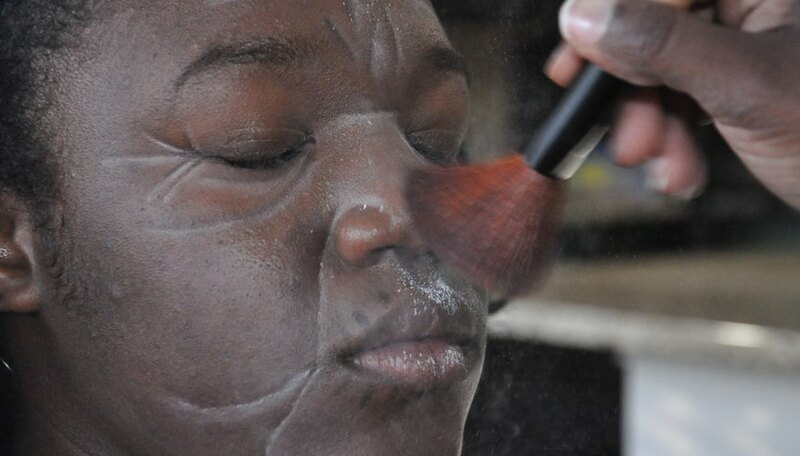 Some skin types are sensitive to makeup, and most theatrical makeup is not hypo-allergic and can cause rashes and breakouts. If you are unsure about your skin sensitivity, test a small section of skin with the theatrical makeup to test for skin allergies.